What makes Bird in Hand stands out is its location. At 400m above sea level in a cool pocket of the Adelaide Hills, the grapes enjoy a long ripening season with warm days and cool nights, enabling them to ripen with full flavours but still retain their acidity. Couple this with the mineral-rich soil from the former gold mines, plus the philosophy of making balanced wines that compliment rather than dominate food, and it is no surprise that all the Bird in Hand labels have numerous awards under their belts. Bird in Hand has three labels, all named after defunct gold mines that operated in the district in the mid 1800s. Two in Bush is an easy-going 'drink now' style fermented in stainless steel tanks, while Bird in Hand is a more serious wine that has spent some time in barrels. Nest Egg is the finest and only released in the best years with a limited quantity. I love the Bird in Hand Riesling 2010 for its liveliness and crisp acidity, and the Nest Egg Chardonnay 2008 for the complex nose and creamy mouthfeel. If you are a fan of sashimi you must try pairing it with Bird in Hand Sparkling Pinot Noir. Its vibrant red fruit aroma enhances the freshness of the fish and it stands up to the wasabi and soy sauce flavours. And of course, the appealing pale salmon colour is perfect next to salmon or tuna sashimi. The judges in the 2011 Cathay Pacific Hong Kong International Wine & Spirit Competition 'Best Wine with Sashimi' panel, including renowned chef Yanagita from Nadaman in the Hong Kong Shangri-La, all agreed that they were a perfect match. The wine was the trophy winner in that class. I was told that Japanese restaurants in Hong Kong are queuing up to buy it. Bird in Hand is a family business. Andrew Nugent is the resident viticulturist and winemaker while brother Justin is the travelling ambassador. With our booming neighbour, no wonder Justin is spending more and more time in China. 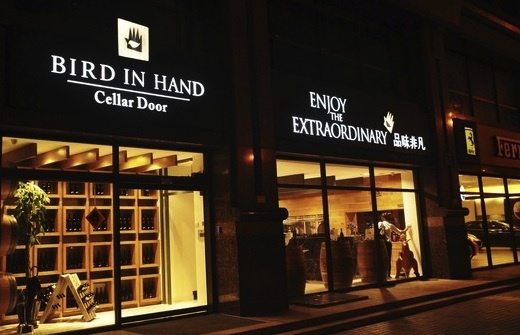 They have just opened a replica Bird in Hand cellar door in Dalian (大連), decorated with vines from the Adelaide Hills vineyard, and have plans to open more in the second tier China cities. The winery is producing 70,000 cases of wine per year at present but has a capacity of 200,000 cases — hopefully just enough to satisfy the thirsty Chinese demand. Get your wines from Northeast before they are snatched up by the Japanese restaurants or our mainland compatriots.